V2288. GIOVANNI ZENATELLO, Vol.IV: Serenatella (Montanari); Mattinata (Leoncavallo); Arias from Les Huguenots, Die Meistersinger, La Fanciulla del West, Germania, Aïda, Il Trovatore, Ballo, Otello, Andrea Chénier, La Boheme, Pagliacci, Siberia & Adriana Lecouvreur. 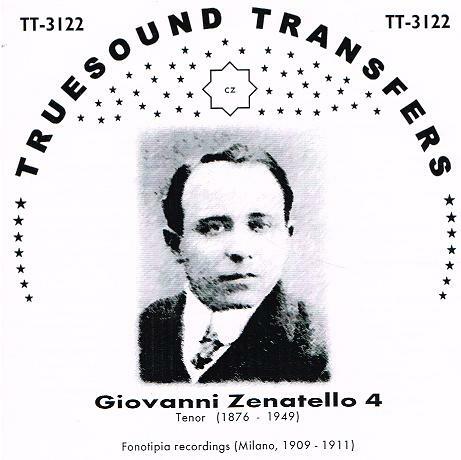 (Germany) Truesound Transfers 3122, recorded 1909-11, Fonotipia, Milano. Transfers by Christian Zwarg. "Giovanni Zenatello was born in Verona and enjoyed an international career as a dramatic tenor of the first rank. Otello became his most famous operatic rôle but in addition he sang a wide repertoire. Zenatello's operatic career gathered momentum during the early years of the 20th century, and on 17 February, 1904, he created the role of Pinkerton in the world premiere of Puccini's MADAMA BUTTERFLY at La Scala where he remained a member until 1907. He also sang at the Royal Opera House, Covent Garden, London, in 1905-06 and 1908–09; at the Manhattan Opera House in 1907-1910; and with the New York Metropolitan Opera company, on tour, replacing Enrico Caruso, in 1909. He was a member of the Boston Opera Company from 1909-1914 and sang often, too, in South America and Mexico and in various cities of Continental Europe. Zenatello's voice had matured into that of a clarion-voiced dramatic tenor during his La Scala years, and he succeeded Francesco Tamagno as the world's greatest exponent of Giuseppe Verdi's OTELLO. He performed this extremely taxing role more than 300 times, beginning in 1908, and recorded highly acclaimed extracts from the work on 78-rpm discs. Zenatello returned to Covent Garden in 1926, singing Otello in a series of performances which were partly recorded live by HMV. After a final stage appearance (in New York) in 1933, he retired from opera and taught singing and dabbled in the management of promising young singers. The coloratura soprano Lily Pons was a notable 'discovery' of Zenatello's in the twilight of his on-stage career. He took Pons under his wing and arranged for her an audition before the Met's general manager, which resulted in the young French-born singer making a successful New York début in 1931. As to his private life, Zenatello lived with the Spanish mezzo-soprano Maria Gay from 1906 until her death in 1943. They were often described as husband and wife although they may never have actually married. He and Gay performed opposite each other on many occasions and settled down together in Manhattan in 1936. Back in 1913, Zenatello had been instrumental in having the Verona Arena, built originally by the ancient Romans, restored and turned into a world famous open-air venue for operatic performances. That same year the arena was used to mount a grand production of AÏDA, marking the centenary of Verdi's birth. In 1947, Zenatello arranged for a promising young soprano named Maria Callas to appear at the arena's Summer Festival in Ponchielli's LA GIOCONDA. This appearance would give Callas invaluable exposure in Italy and help set her on the path to future stardom. Zenatello left an important musical legacy in the form of a considerable number of commercial recordings of his voice, made both acoustically and, after 1925, with the aid of microphone technology. His first discs were made in Italy by The Gramophone Company in 1903, followed by a long series for Fonotipia Records. Later, he recorded for the Columbia, Edison and HMV labels. They reflect the wide range of his repertoire and the best of them confirm the impressive power, thrust and ardency of his singing. Zenatello left recorded memoirs from the rôles he created (including arias and duets from SIBERIA, MADAME BUTTERLY, and FIGLIO DI JORIO)."